On June 20, 1942, 2nd Lt. Eugene E. Barnum was flying in the No. 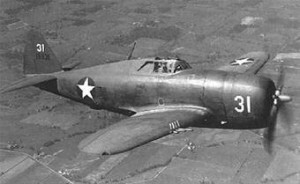 2 position in a three plane string formation over the Bridgeport, Connecticut, metropolitan area when his aircraft, a P-47B, (Ser. No. 41-5919), began having engine trouble after the trio came out of a step dive and leveled off at 3,000 feet. First the engine started to misfire, then it began throwing oil, and trailing smoke. Lt. Barnum dropped out of formation and attempted to fly back towards Bridgeport airport, but as he was passing over Milford, his engine abruptly stopped, with the propeller frozen. Knowing he could not make the airport, Lt. Barnum crashed landed in a marsh area. The plane suffered heavy damage, but Lt. Barnum escaped with minor injuries. After climbing out of his plane, he sat and waited for help to arrive. At the time of this forced landing Lt. Barnum was assigned to the 61st Fighter Squadron at Bridgeport, Connecticut. He received his pilot’s wings on April 29, 1942.